Commentary: The very first Commander Neyo was sold in a Battle Pack at Walmart. Later, he was carded and sold in Saga Legends. Both figures are pretty much the same. Neyo is built off the 2003 Clone Wars Clone Trooper body, which was a little chubby. In 2003 it looked great, it was the best thing ever. 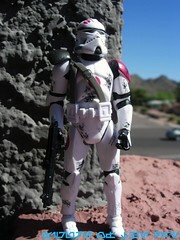 By 2007, we've had a few new Clone Trooper body sculpts and this one was starting to show its age. By no means is it a bad figure, as its 14 joints and nifty black "damage" looks pretty great. He can sit on his BARC Speeder without too much trouble, but it will cause his crotch to stretch a bit. (Hot stuff, eh?) The figure is a great example of tooling reuse, as the all-new helmet looks great and a new belt with a shoulder harness adds a lot to the look of the figure. For its time, this figure hit all the expectations. The expectation being, of course, that Hasbro slapped a helmet and paint on a figure you've bought 13 times over. While perfectly acceptable and not at all a bad figure, this is one Hasbro could probably stand to go back and redo at this point. The Vintage Clone Trooper body could be a great basis for a new, better-for-the-bike action figure plus you could tool up the binocular helmet for the regular trooper figures. Collector's Notes: Just the figure from Saga Legends, carded, is about ten bucks. The Treachery on Saleucami Battle Pack runs $20 or so usually, but can go as high as $45. Be cheap! It's not good enough to warrant $45.